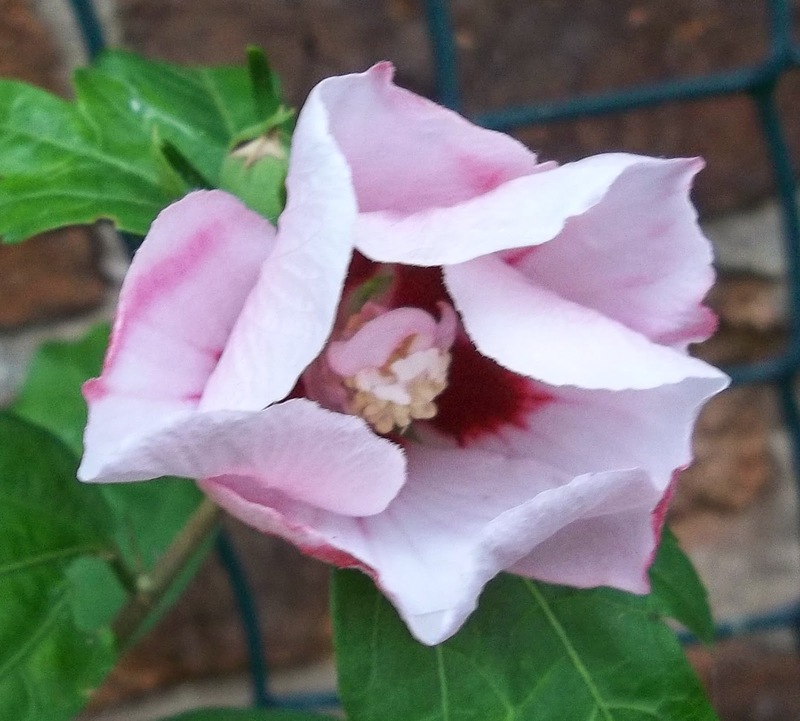 To help to forget about the rather unseasonably cold weather, here are a few photos of plants flowering happily outside. 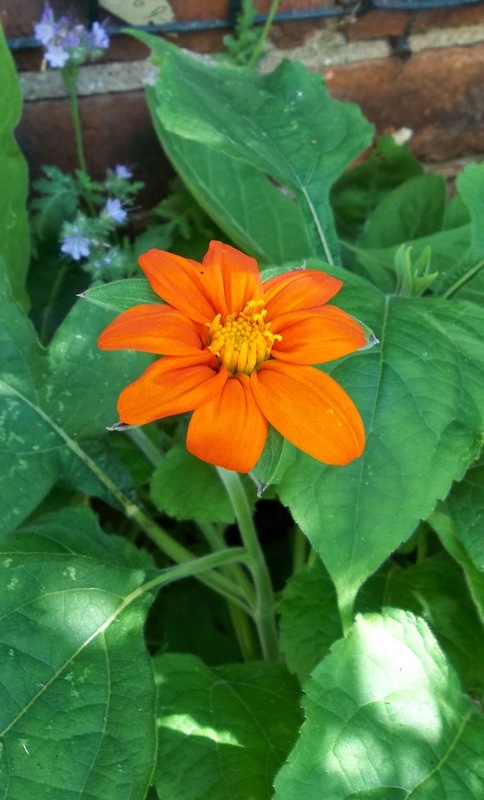 This bright orange (I'm gradually starting to think orange might be a good thing in the garden) flower is Tithonia Torch which I grew from seed this year and which has finally started to bloom. 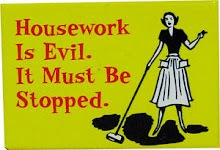 It is a very cheerful thing. 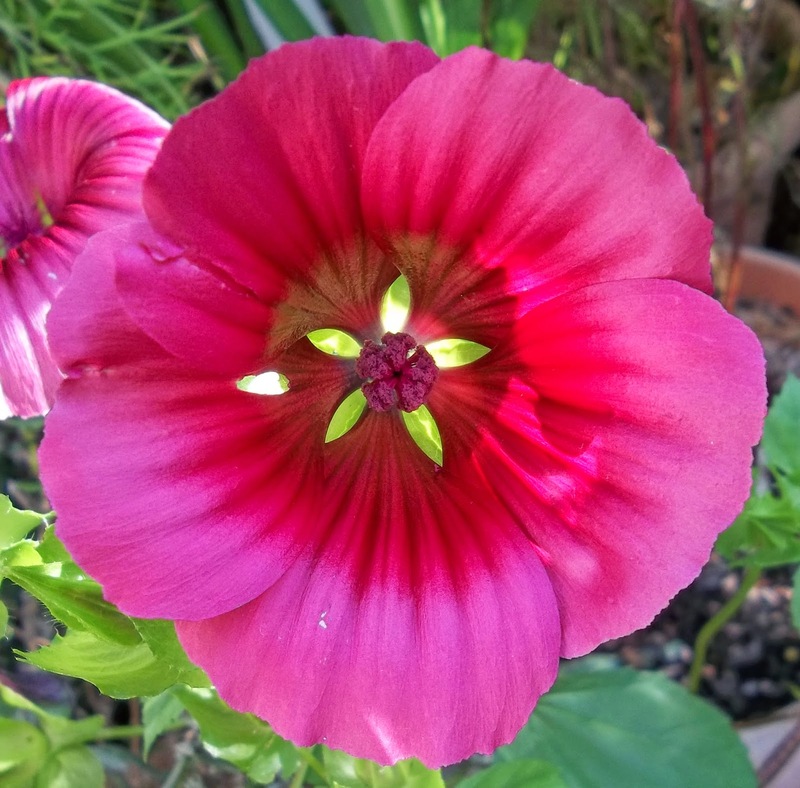 Here's another success from my seed sowing. 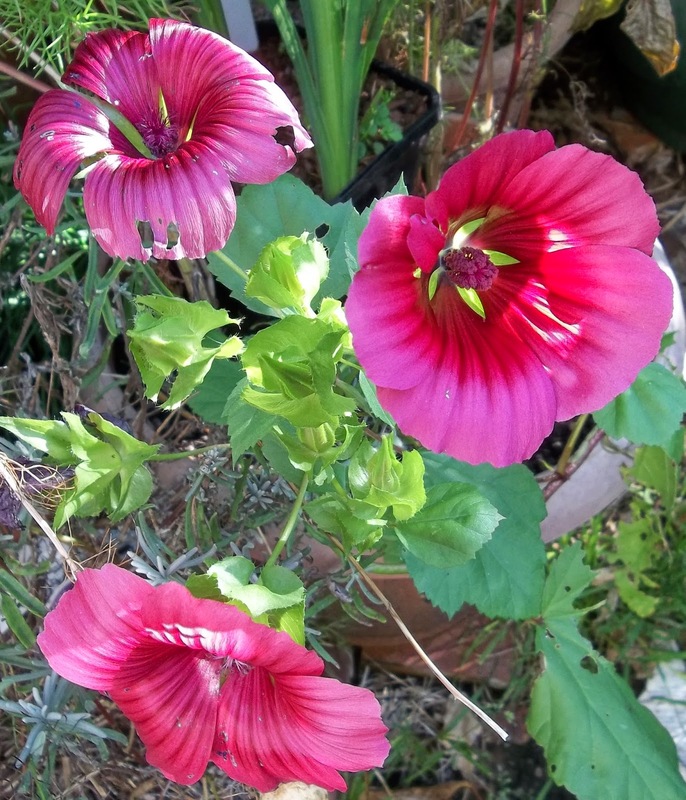 This is Malope Triffida Vulcan (a relative of the mallow). This particular specimen is rather spindly and leggy because I left it too long before planting it out, but the flowers are fabulous. The colour is so bright. 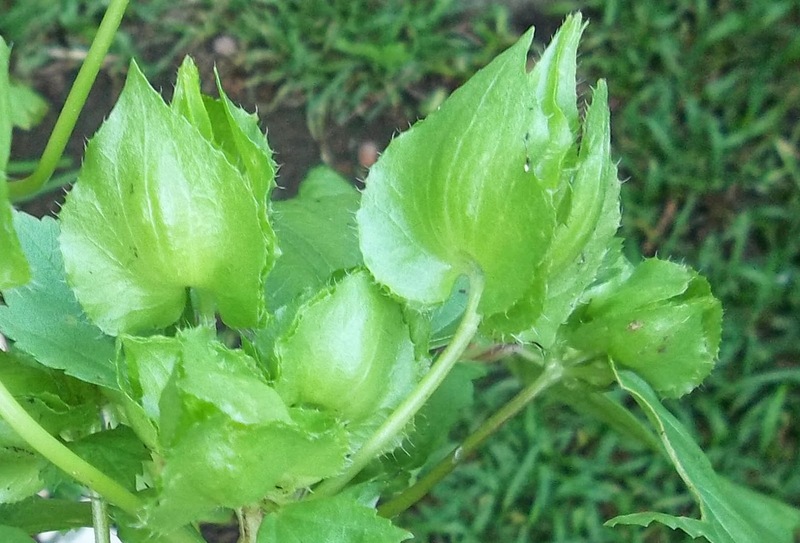 Even the buds are rather lovely. However, this plant is a magnet for slugs and snails and I only have a couple of these plants left, but I am really enjoying them. 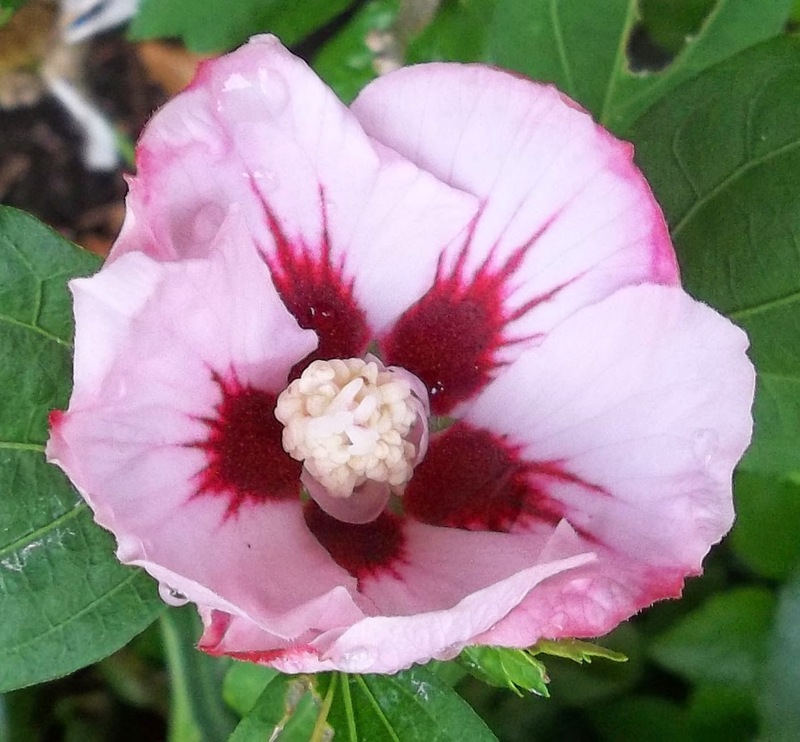 Hibiscus Syriacus Red Heart is flowering well too. I like the swirling pattern the unfurling petals make. 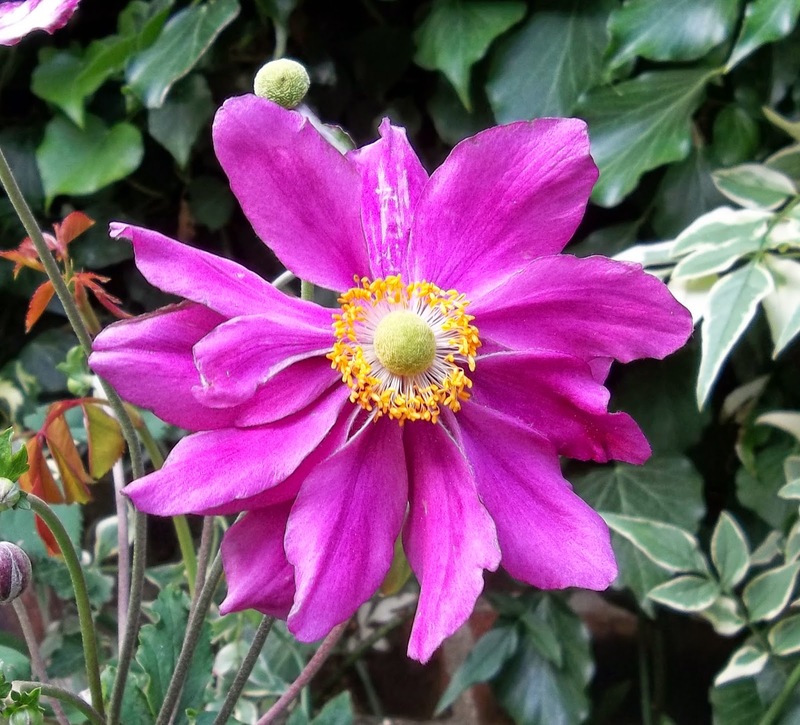 Anemone Bressingham Glow is flowering really well this year with very tall stems. 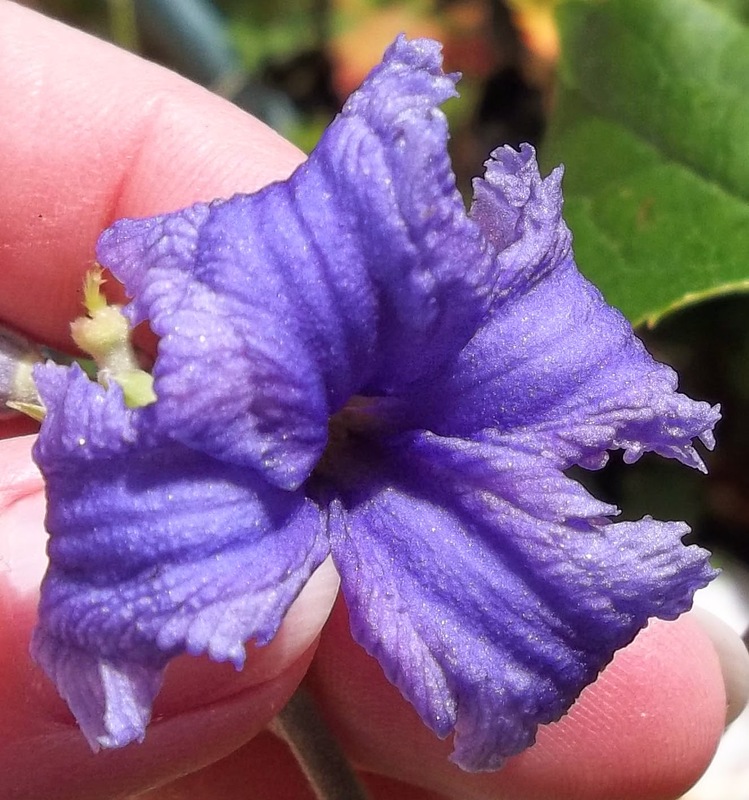 My latest clematis (Clematis Heracleifolia Wyevale) is one which I absolutely love. 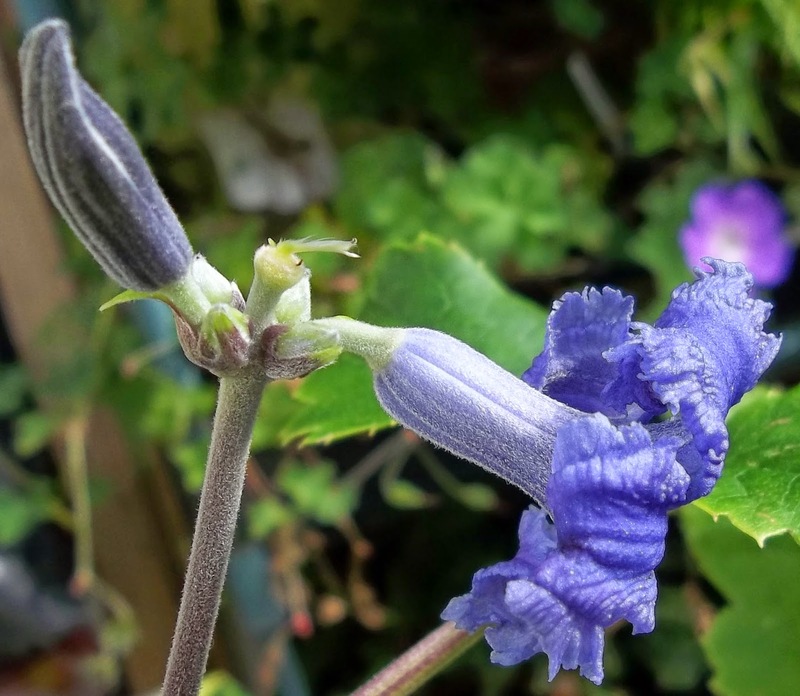 It is a herbaceous variety with tall strong stems and lovely bluebell-like flowers, which have a beautiful scent. All gorgeous. And a reminder that soon (hopefully) my garden too will burst into colour. Lots and lots and lots of colour. And scent. Thanks, EC. We are gradually heading towards autumn now, rather too quickly, considering it is still August! 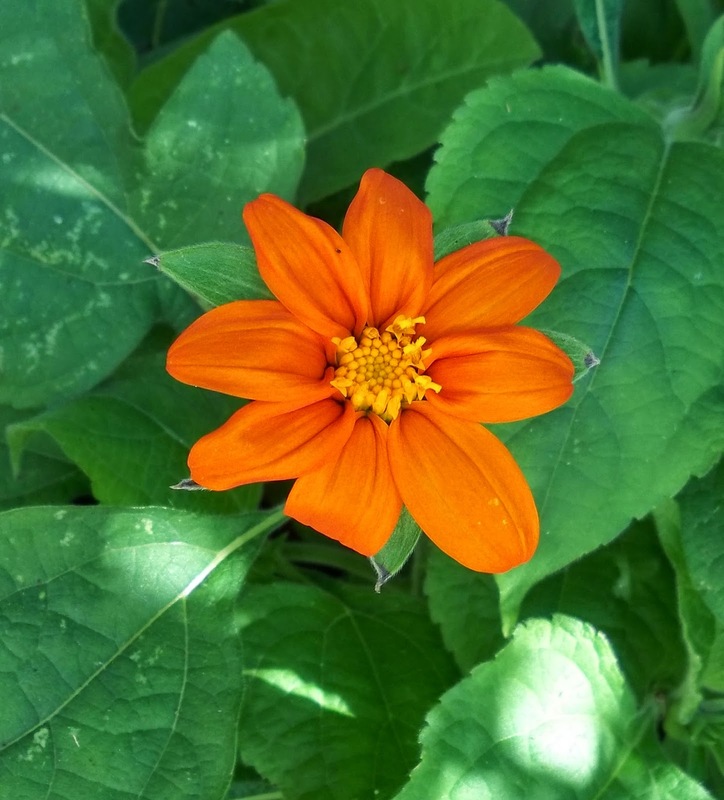 However, the summer flowers are still going and the autumn ones are gearing up to replace them. Not too long for you to wait for the summer now! 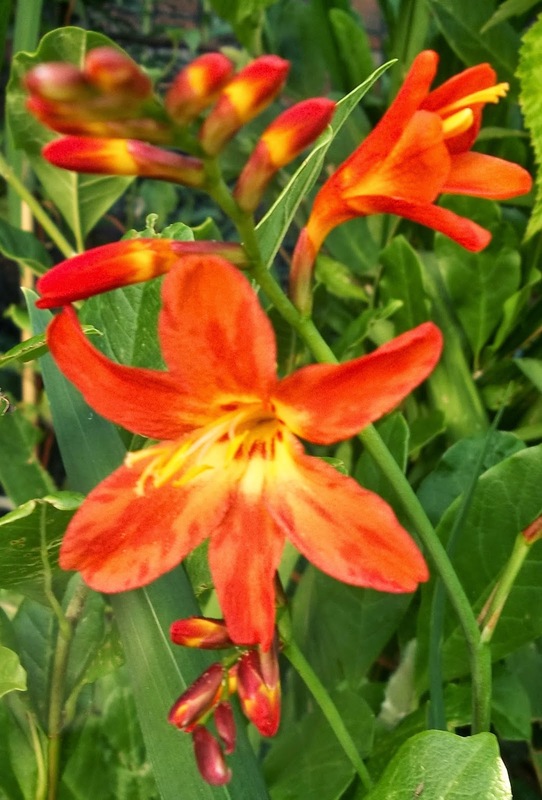 So many beautiful flowers in your garden. I saw Clematis Heracleifolia Wyevale for the first time. Thanks, Poirot. They are fabulous - I quite agree. My oinly slight problem is lack of space in my garden! It looks like it will have to go in a pot! I'm your partner for the Autumn Swap hosted on Blueberry Heart blog so..... hello and hi from Alicante in Spain. I see this will be your third Autumn Swap the same for me. I'm looking forward to hearing about felting which I know very little of and I'm off to browse around your blog to find out about you too. Thanks and welcome! It's great to be partnered with you and I'll email you for details and dates and likes and dislikes etc. I'm looking forward to the swap very much. So nice to still have colour in the garden, isn't it? Your place looks very much like summer, lovely! Thanks, Mirjam. I do like lots of colour in the garden and have just bought an Echinacea, a phlox and a Japanese anemone, with absolutely no idea where on earth I am going to put them! I just can't help myself!